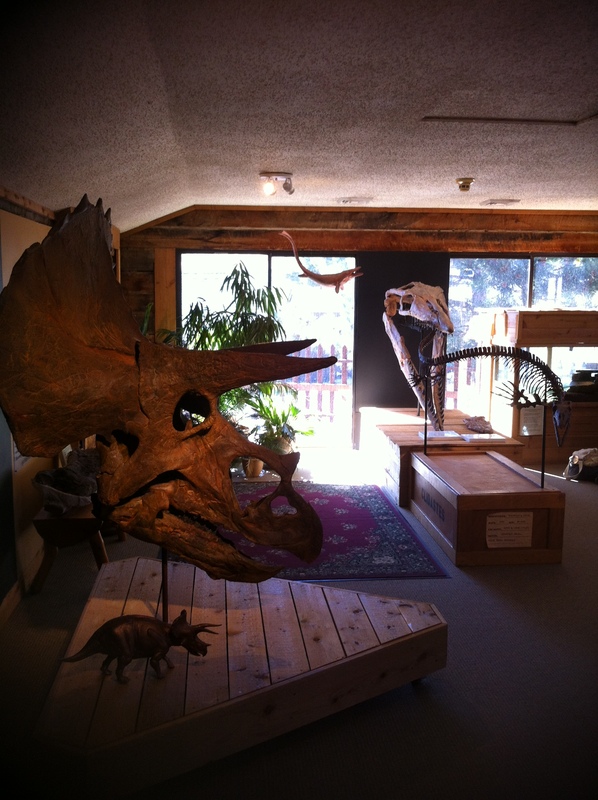 Last week, I had a fantastic experience at the Morrison Natural History Museum, a little gem tucked away in the tiny town of Morrison, Colorado, on the north side of Denver. 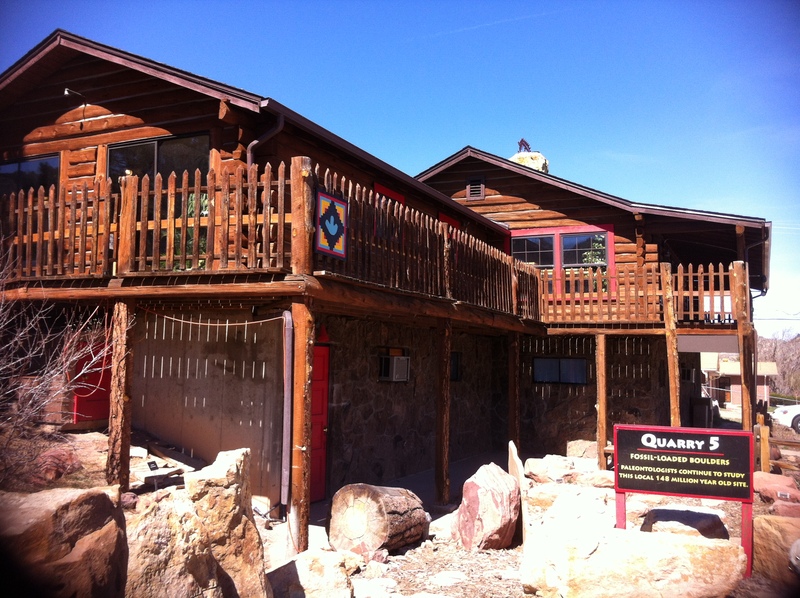 Since its opening in 1985, the Museum has served as a local educational resource covering the region’s plentiful paleontological resources. According to its website, the Museum is primarily a teaching institution. An affiliated foundation raises funds to bring local students on field trips, in support of the Museum’s mission to nurture “an understanding of and respect for the deep past.” In keeping with this teaching institution, gentle touching of all the fossils and casts is encouraged. This policy, and the design choices that go with it, are what truly set the Morrison Museum exhibits apart. Paleontologically-inclined people are of course familiar with the Morrison Formation, the sequence of Upper Jurassic beds that extends across much of the western United States. The formation, which extends some 600,000 square miles, was named for the town of Morrison, where fossils were first discovered in 1877. The Morrison formation is probably best known as the epicenter of the “bone wars” between Othniel Charles Marsh and Edward Drinker Cope, who each led competing teams of fossil hunters across the region, attempting to best one another’s discoveries. Marsh and Cope were affiliated with the Peabody Museum in New Haven and the Academy of Natural Sciences in Philadelphia, respectively, so the fossils they collected all ended up back east. Indeed, while the Morrison region is among the most important and productive places for finding dinosaurs in the country, comparatively few of the treasures found there have remained in the region. 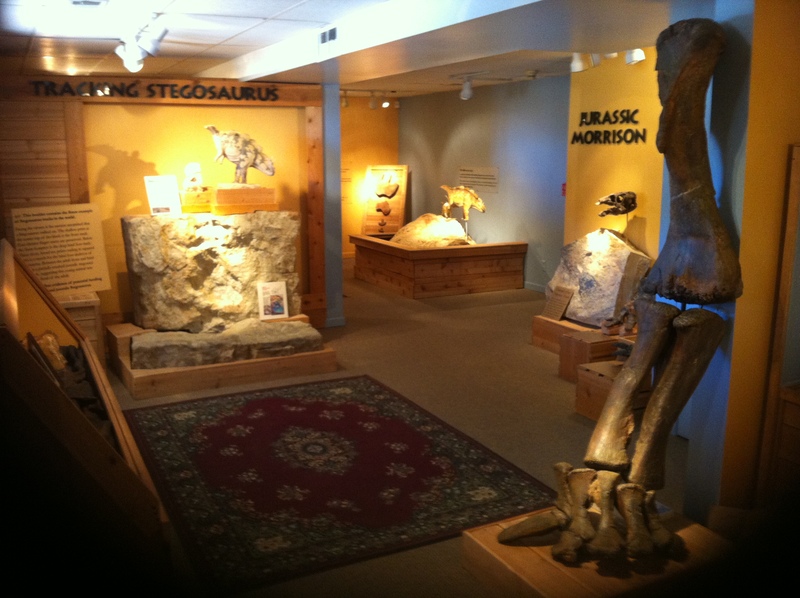 The Morrison Natural History Museum therefore exists, at least in part, as a dedicated local repository and interpretative center for the region’s natural history. The 1st floor Jurassic exhibit. The Museum’s exhibit space is tiny, only 2000 square feet, but it is chock full of awesome. The exhibition consists of three main rooms, each one representing a geological time period. In the first floor Jurassic gallery, highlights include partial casts of Allosaurus and Apatosaurus, the holotype of Stegosaurus, trackways attributed to Stegosaurus and a baby sauropod, and some original 19th century lithographic prints from Marsh’s monographs. For those interested in the history of paleontology, and of science in general, those prints are particularly fascinating. Infant sauropod trackway with model of probable trackmaker. 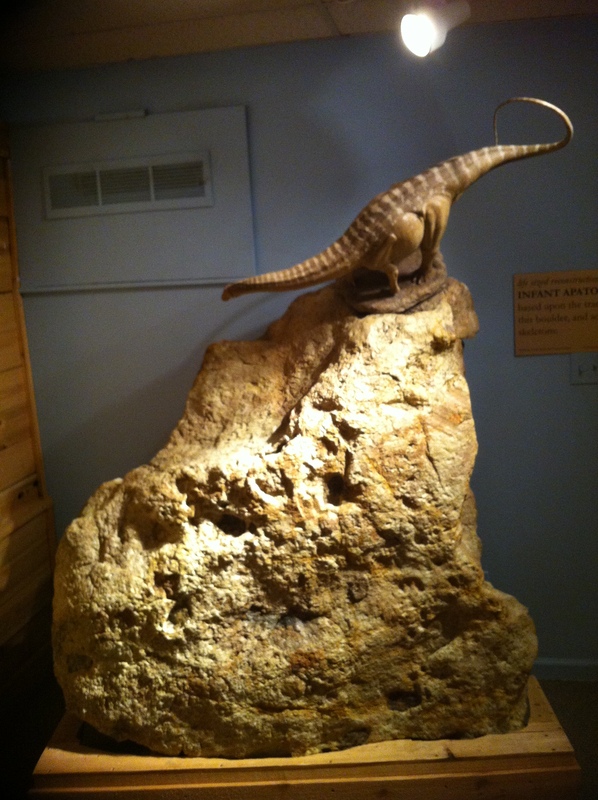 Cretaceous and Cenozoic exhibits are found on the second floor. Most of the objects here are casts, most notably full skeletons of Platycarpus and Pteranodon, and skulls of Triceratops, Tylosaurus and a Columbian Mammoth. There are also a number of live animals on display, including a very charismatic monitor lizard thoughtfully placed next to its close relatives, the mosasaurs. 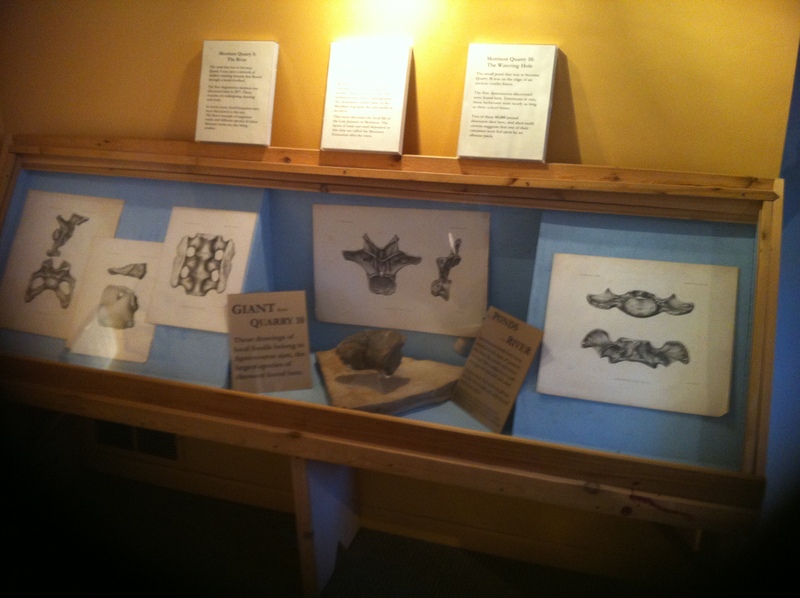 Original 19th century lithograph prints of fossil illustrations by Marsh’s team. The signs and labels in the exhibit are noteworthy for their succinctness and clarity. It can be extremely challenging for writers of museum copy to provide appropriate depth of content without confusing, boring or alienating audiences with too much text. Overlong and unfocused labels are particularly common in small museums, where most of the copy is written by a single curator bent on sharing everything he or she knows about a topic. On the other end of the spectrum, larger, committee-designed exhibit labels can be too brief, too simple and too narrowly focused on the exhibit’s educational goals to be of much use to anybody. Happily, the Morrison Museum avoids both of these pitfalls. Labels are simple and attractive, but still informative and up-to-date. 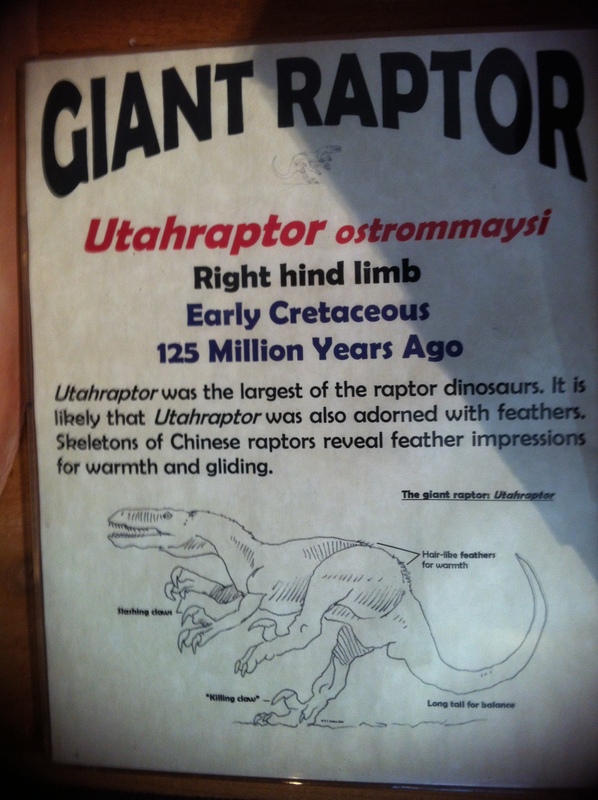 I was rather impressed by the economical way in which they addressed the most important topics in paleontology. An example of a brief but content-rich label. Obviously, the fossils and other objects on display are fantastic, and many, like the trackways, are quite unique. However, as mentioned above, one of the most remarkable aspects of the Museum is that touching of all the fossils and casts is encouraged. Few objects are behind glass; everything is out in the open for people to touch and examine up close. There are many in the museum field who would be horrified by such an arrangement. When putting objects on exhibit, it is a given that they are considered consumable. No matter what precautions are taken, anything put on display will inevitably suffer damage. Of course, the flip side is that exhibit designers want to allow visitors to get as close to the objects as possible. The Morrison Museum has taken this to the extreme. The fossils, many one them irreplaceable holotype specimens, are fully exposed to accidental or intentional abuse by visitors. This is a very bold move on the part of the Museum, and it makes the point that the knowledge visitors can gain from full access to objects is more valuable that the objects themselves. I won’t lie, my initial reaction upon seeing this exhibit layout was open-mouthed horror. But after spending some time in the space, I think the Morrison Museum may be on to something. This is a great way to tap into the multiple intelligences of visitors. Obviously, this system only works because the Museum’s attendance is on the low side (I would hate to see what the summer hordes at NMNH or AMNH would do if they were allowed to run wild among the mounts), but given these circumstances I think the open-access approach is a great educational tool. Overall, I was very pleased with my visit to the Morrison Museum. The volunteer staff knowledgable, passionate and helpful, the exhibits were excellent, and the handful of other visitors passing through (mostly young children) seemed genuinely engaged. The Museum is well worth a stop for anyone in the Denver area, and may well be a worthwhile model for other museums to follow. Speaking as a 20-something interested lay person, I can say that I haven’t had that “I NEVER WANT TO LEAVE, EVER, WAAAAH” reaction to a museum in a long time. It’s fantastically engaging. It seems like a good complement to the larger museums – I think a kid on a field trip would get much more out of the Denver museum for having seen the kind of presentation Morrison is suited for, and vice-versa. It was sort of like the whole museum was a really, really well designed and focused Discovery Room, wasn’t it? Yep, except instead of the usual junky teaching specimens, they were using the Stegosaurus holotype.